Oil on canvas. 40" x 30"
​​​​​​Victor Candell was born in Budapest, Hungary on March 11, 1903. By the age of fifteen he was a successful poster-maker and was beginning to branch out into caricatures and illustrations for theatrical journals and magazines. He came to the United States alone at age sixteen and studied in New York. From 1921 to 1928 he worked at a variety of artistic pursuits -- murals, portraits, illustrating childrens books -- while saving money to go to Paris. Candell spent three years (1928-1930) studying in Paris where he frequented the Louvre, joined a group of artists known as Les Surindependents, and began exhibiting his own works. When he returned to the United States he embarked on several years of intensive study. During this period he supported himself by doing portraits and commission and participating in the WPA's "Easel Project." His first exhibit was at the Brandt Gallery in 1940; he remained with them until the gallery closed when he moved to Grand Central Moderns for many years. His first teaching experience was in the 1940s at the Navy Hospital in Brooklyn and later, at the Brooklyn Museum School of Art, the Cooper Union, and the Columbia School of Painting in NYC. He exhibited his works at the Whitney Museum of American Art, the Metropolitan Museum of Art, the Art Institute of Chicago, the Corcoran Gallery in Washington, D.C., and the Carnegie Institute. 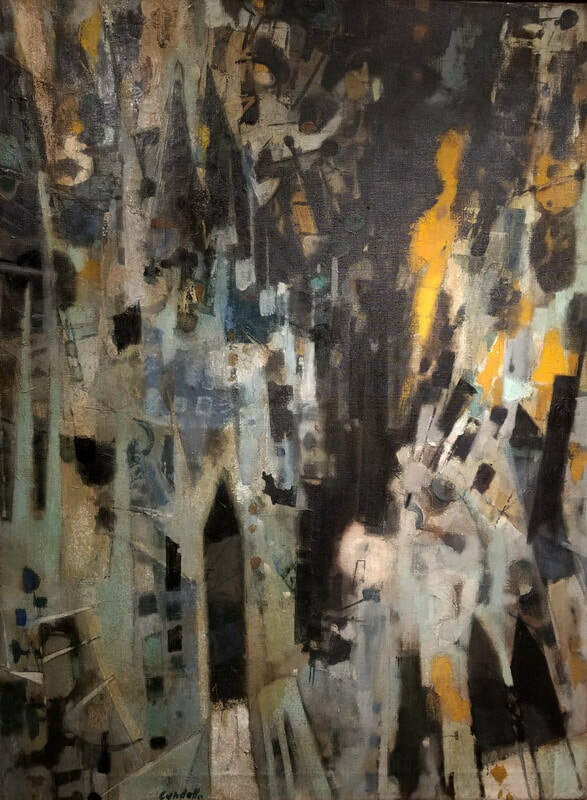 Victor Candell was a New York modernist whose initial preoccupation with explosions, violence and the horrors of the period following World War II led him to develop an dynamic abstract painting style. A number of his works from this period were purchased by the Metropolitan and Whitney museums. Candell showed regularly with the Grand Central Moderns, and spent summers in Provincetown depicting the recurrence of seasons and the natural cycle of plant and animal life in his paintings. In the late 1950's, Candell found his "explosions in nature" and used them as inspirations for many of his bold canvases, such as "Sky Flowers", where Candell explores the natural explosion of flowers as they emerge from the ground in the spring and soar towards the sky and again in "Cloudburst", where Candell portrays the energy released in a downpour as strong alternations of black and white color heightening the contrast between the two. In 1958 Candell and Leo Manso started the Provincetown Workshop, a small art school modeled after the Cooper Union that remained in operation for more than twenty years. For many art students of the day, this became a replacement for the recently closed Hans Hofmann School. Mr. Candell received numerous awards for his art work, including prizes from the Museum of Modern Art and the U.S. Treasury. His paintings are included in the collections of the Metropolitan Museum, The Whitney Museum, The Corcoran Gallery, The Carnegie Institute, and the Boston Museum of Fine Arts.